Vietnamese football supporters have celebrated the under-23 team’s progress into the final four of the Asian Cup as if the team had already won the tournament or qualified for a FIFA World Cup. 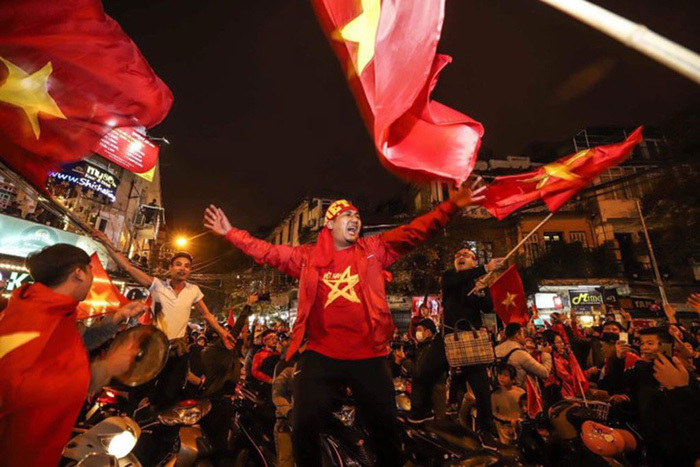 Foreigners in Hanoi, Ho Chi Minh City and other towns across the country were surprised to be confronted by seas of people who took to the streets carrying the national flag in celebration of the U23’s quarterfinal penalty shootout win against Iraq on Saturday night. Revelers rejoiced after the game had ended in a tense 3-3 draw after extra time at the AFC U23 Championships being held in China. After learning of the reason for the outpouring of national pride, expats and foreign visitors were left scratching their heads, and pondering whether it was too early to celebrate. However, a look back at Vietnam’s football history over the last decade may explain why fans have not waited for a trophy to start celebrating. Vietnam debuted at the U23 Asian championship in 2016, but failed to make it through their group. This year, in only their second appearance, the Golden Stars have made history after beating Australia 1-0 in their group game on January 14, becoming the first-ever Southeast Asian team to earn three points at the tournament. Vietnam then drew with Syria 0-0 in their last group game to become the first Vietnamese team to advance to the quarterfinals of the AFC U23 tourney. The fairy tale continued on Saturday night after Vietnam and Iraq went all the way during their 120-minute thriller before deciding the game in a dramatic penalty shootout. All five Vietnamese penalty takers made no mistake from the spot, meaning the Golden Stars advanced to the semifinals for the first time, sparking scenes of wild celebration on the streets. The impressive performance of Vietnam U23s in China is healing some of the wounds felt by local fans, who have had their hearts broken by the national and junior teams on so many occasions before. Two of the most painful memories stem from the 2014 and 2016 editions of the AFF Championship, a biennial competition contested by teams from Southeast Asia. Vietnam were beaten at home by Malaysia in 2014, and then again by Indonesia in 2016, both in the second-leg semifinal stage, causing grief amongst diehard supporters. Then came the recent Southeast Asian (SEA) Games, where Vietnam have competed in the men’s football competition since 1995. Despite having made it to the final five times, in 1995, 1999, 2003, 2005 and 2009, the team have never won. They claimed bronze in 2015, but were eliminated from the group stage in the latest edition in Malaysia. Supporters, who were let down by the lackluster performance of the team there, were understandably overjoyed at the bravery and good form of the current under-23 team. Vietnamese supporters have a habit of taking to the streets whenever their team win an important match, but the last time they celebrated a trophy was nearly ten years ago. At the 2008 AFF Championship, Vietnam made it to the two-legged final with Thailand, who co-hosted the tournament with Indonesia. Vietnam supporters were overwhelmed with joy after beating Thailand 2-1 in the first-leg in Bangkok, and following that up with a trophy after clinching a 1-1 draw in the second-leg in Hanoi. The whole country celebrated following that historic moment, but it has proven to be nearly a decade later that they could rejoice with similar pride, having fearlessly taken on football giants South Korea, Australia and Iraq at these championships. Vietnam now have another chance of making history in their semifinal clash with Qatar on Tuesday. While optimists believe the team are one game away from the final, even appearing in the third-place play-off will be more than enough for some supporters. Some believe that the team’s inability to win at the SEA Games is no longer important, as what they have shown in China deserves the praise of fans. One local fan and Tuoi Tre (Youth) newspaper reader, Phuong The Ngoc, wrote that in football, what is more important than trophies is the pride players bring to fans.